London Ceramics are a natural stone flooring specialist that provide both traditional and contemporary flooring using high quality products sourced from around the world. London Ceramics are an established company using only reputable suppliers so they can offer the highest quality natural stone tiles and flagstone flooring to their customers. London Ceramics also offer a range of gorgeous Victorian floor tiles. These are brilliant for Victorian houses and look fabulous in hallways, bathrooms, kitchens & conservatories. There are a mixture of traditional patterned tiles and plain tiles in the range and samples can be ordered. Lastly if you love wood floors but need a more practical solution for your kitchen, bathroom or conservatory, take a look at the lovely range of wood effect porcelain floor tiles. London Ceramics offer discount stone floors as well as a range of natural stone fireplaces. London Ceramics can also offer next day delivery in the UK when orders are received by noon offering a reliable service to their customers. 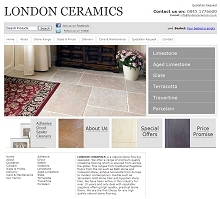 Stone tile ranges, size information and prices can all be found on the London Ceramics website.